[UPDATED] Lino Celle, a Filipino anchor for RMN Radio Pinoy in New York, reported Janet Lim Napoles’ alleged location hours before she surrendered. Past 9:00 a.m. on Wednesday, President Benigno Aquino III offered a P10 million bounty for the arrest of Napoles. “I-a-announce namin sana a little later, ano, pero dahil natanong mo na announce ko na sa inyo – P10 million ang reward for information leading to the arrest of Ms. Napoles. Para klaro ha, 10 million pesos,” he said in a media interview at Sofitel Philippine Plaza Manila in Pasay City where he attended the East Asia Conference on Competition Law and Policy. At 9:37 p.m. same day, Malacañang announced that Napoles surrendered to the President. 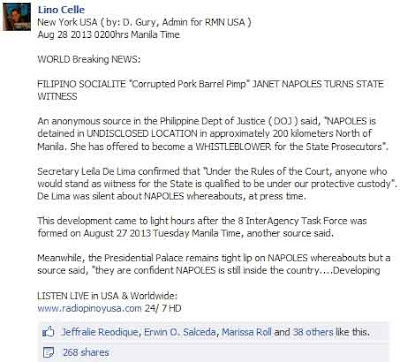 Presidential spokeperson Edwin Lacierda had his own narration on how Napoles turned herself to authorities. In a phone patch interview past 2:00 p.m. the following day, August 29, Celle confirmed his report to ANC’s “The Bureau” anchor Karmina Constantino. 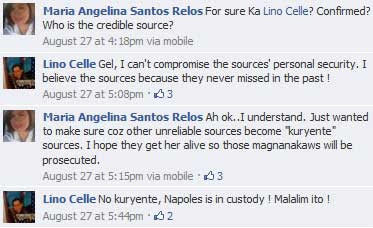 Celle disclosed that after he got the tip from his “source” by phone, he called several friends in Manila to ask for updates before proceeding with his Facebook post.